Welcome to another installment of The Pet Corner! In this post, I will be discussing how to take care of one of the cutest pets in the wizarding world,...the Pygmy Puff! Hello everyone and welcome back to The Pet Corner! 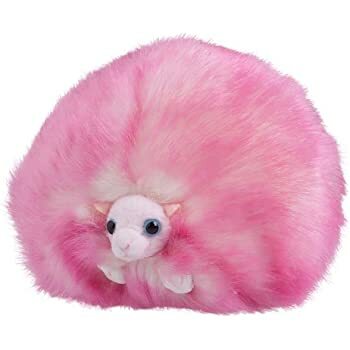 Thank you for all the positive comments in the first post and special shoutout to Morgana Rosenberg for suggesting this week’s topic, the Pygmy Puff! Pygmy puffs are small, fluffy, round creatures about the size of a small ball. They are thought to be mini versions of Puffskeins which are also popular pets within the wizarding world. The first pygmy puffs were bred by Fred & George Weasley in two colors, pink and purple, and were met with a very high demand. Of course, the reasoning behind this high demand is very simple: THEY ARE SO CUTE! The behavior of these adorable furballs only increases their cuteness factor, rolling around while making tiny squeaks. Like their bigger Puffskein counterparts, pygmy puffs do not mind being thrown around or snuggled with. But, unfortunately, also like their counterparts, they are known to use their long tongues to eat bogeys from sleeping wizards. I_I You can buy these fluffy furballs on WoP in the Magical Menagerie at Diagon Alley with the complete color choices of pink and purple. Did you know there is a belief that Pygmy Puffs sing on Boxing Day (December 26)? Pygmy puffs eat just about everything due to their ancestral nature of scavenging from food scraps to bugs (which also explains their bogey eating habit). This lack of food pickiness is one of the many reasons why pygmy puffs are easy to take care of as opposed to many other common pets. You can buy food for your beloved friend from the Magical Menagerie. Pygmy puffs are known to live just about anywhere they can call a home from school bags to buckets to the small space underneath your living room couch. Since there are no known key predators, the shelter you choose for your pygmy puff can be as flexible as you wish. However, for the safe side, I would recommend buying a small cage for the creature just in case if you know there is something prowling about or need a safe way to travel. Besides these scenarios though, I’d say feel free to make your bed or even your shoulder as its home. What is it Like Having One as a Pet? For those of you that have many pets like I do (eight and still counting :) ), you’ll be glad to know that pygmy puffs tend to get along with most pets. From my time with current pet owners, it seems there is a general consensus that the only creatures pygmy puffs tend to avoid are large animals, such as owls and cats with some being “shy” and some being “rather aggressive when it comes to owls or cats.” However, there are a few that seem to get along with all kinds of creatures, including owls and cats, most likely due to personality differences. Here is some advice from current pygmy puffs owners for those of you who wish to adopt this cute creature. Thanks for reading this installment of The Pet Corner! If you wish for me to mention a specific pet, please comment below or owl me and remember to write down the specific species if applicable. Rachel Dare Pigmypuffs!!!!!!!! Sooooo cute!!!!!!!!!! Catherine Rose I love it I so need one now!!! John Samson They are so adorable!!!! Esteban Mackleroy PUFFS PUFFS PUFFIES! Amazingly written Hannah!